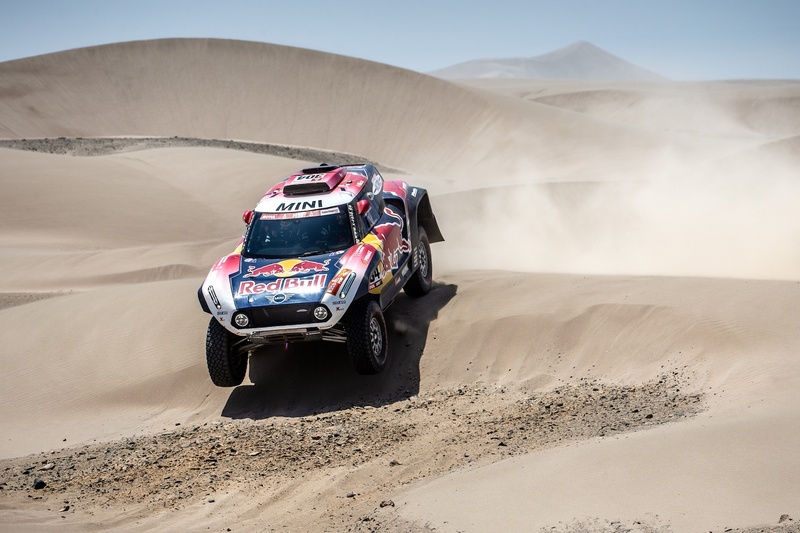 It was a successful seventh stage at the Dakar Rally for MINI crews, managing to occupy all three top positions at the end. Stephane Peterhansel was the best placed driver, claiming his second stage win in the MINI John Cooper Works Buggy, followed by Joan ‘Nani’ Roma and Carlos Sainz. The race was rather close by Dakar Rally standards, only 9 minutes and 28 seconds separating the winner from the third place on the podium. The Stage was rather heavily disputed but in the end won by Peterhansel and Castera, who took the lead early on and didn’t slow down until the end. This win is allowing the French duo to raise to second overall place, less than 30 minutes away from the leading Toyota. The crew in second place, with Nani Roma behind the wheel and Alex Haro right alongisde him was the only real threat to Peterhansel in the race, even stealing the number one spot at one point but finishing 4 minutes and 33 seconds behind the French man in the end. Carlos Sainz finally seemed to lose all his bad luck in this stage and, alongside co-driver Lucas Cruz, managed to claim a third place. This offered the Spanish team re-entry in the overall top ten, as they win back some valuable time. Fourth place went to the current overall leader, Nasser Al-Attiyah, while fifth place went to another MINI crew: Cyril Despres and Jean Paul Cottret in their JCW buggy. The seventh stage looped around San Juan de Marcona and had a total length of 331 timed kilometers. Things kicked off an hour late as a dense fog fell over the Peruvian city. Anything can happen as we head towards the end of this year’s edition, as the first 5 drivers are separated by less than 60 minutes. Sebastian Loeb is fourth, while Peterhansel and Roma are ranked second and third, behind the leader, Al-Attiyah and his Toyota.